Boqueron is an interesting introduction to Puerto Rico. We eventually discover it's a typical example of a Puerto Rican coastal resort town -- narrow little streets, multiple bars, and a strip of tiny shops devoted to slightly tacky tourist items -- beach towels with naked girls, neon sarongs, etc. But coming from one of the smallest villages in the Dominican Republic, it's culture shock. There is, however, a beautiful national park running all alongside the wide harbor. Unfortunately for us, by the time we arrange a "publico" (a random car that picks up passengers outside the local post office or the best restaurant in town, Rice and Beans with its $3.99 breakfast) to check in at the city of Mayagues and have various other adventures, a diabolical rain sets in...and continues for four days, like the Apocalypse. Roads are washed out, houses flooded, rivers wipe out bridges and flood major highways (of which there are few!). We get in some good snorkeling on a very cool reef at the eastern entrance to the harbor (there is a a light marking the hazard so the best spot is easy to find) before the storm, but once the rain sets in, the harbor turns a frighteningly opaque muddy brown (at least we hope it's mud), and view and access to the park are cut off. We catch water in salad bowls and bail it out of the dinghy. The water from the bowls, we drink; the water from the dinghy, we funnel into the tanks for showering. Capturing our water from the skies seems somehow elemental, a connection to nature that we've generally lost. Even so, we've had enough of the questionable brown bay. Along with Aditi and First Light, we plan to leave as soon as the weather clears. 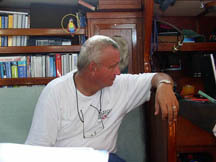 We arrived in La Parguera about a week ago, planning to rest a day or two anchored off the coast of this small town. But before leaving Boqueron, Keith spent a day at a mall, and managed to pick up one of those really horrific colds where you go through a box of Kleenex a day (or would, if we had any -- actually he used about a roll of toilet paper a day and was glad I bought the softer kind). We've decided that, living on the boat, our systems are so unused to germs that we're very vulnerable once back in civilization. An upcoming Christmas visit to the states should be interesting. 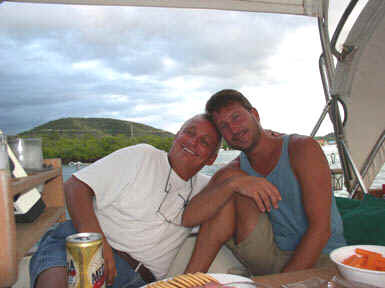 Also in Boqueron, I broke a rib taking a nosedive when we were doing some fancy and abrupt maneuvering in the dinghy. So we holed up here to rest and recuperate, and ended up spending a week. The sunsets over the nearby low cays are amazing. 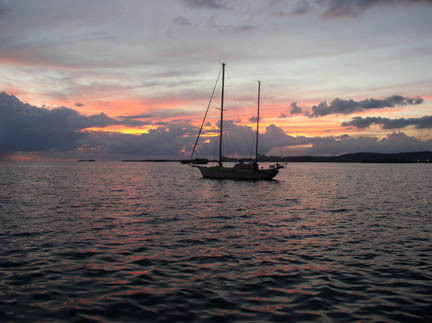 Randy took this from nearby Aditi: it's Solace at sunset in the harbor of La Parguera. The coast here is beautiful -- rocky cliffs, coral reefs, and a few scattered sandy beaches, my favorite, for walking along the water's edge. And reefs everywhere are perfect for snorkeling and diving. However, these little towns on the shore all center around tourism, with strings of tourist shops and bay-cruise boats lining the harbors. We're glad some of our favorite boats are here to keep us entertained. 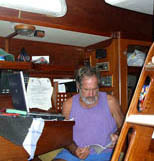 Above, Don & Marcy on First Light watch Randy install their new pachter modem to allow them to get email via radio. So far, it's not working. This, while painful for Don & Marcy (not to mention Randy), makes Keith and me feel better since the pachter was our first choice & we gave it up solely due to cost. Below, Don has his own moment; below that, Don & Keith show their true feelings, then we test out the self-timer. 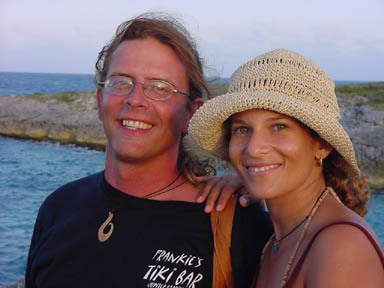 Matt & Marisol from Mar y Sol (their boat is a play on her name -- it also means "sea and sun" in Spanish). They're staying for a year or so to work and build up their cruising funds. 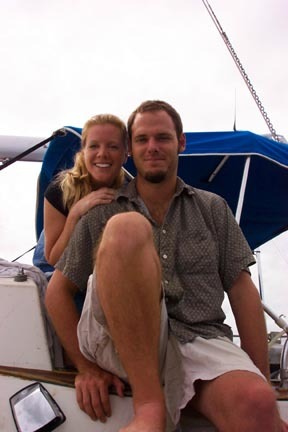 Lori & Jesse from Jeito, now crewing on Impossible Dream to raise money for a new dinghy engine.